It’s hard to place a book below my two highest ratings, but sometimes it just has to be done. 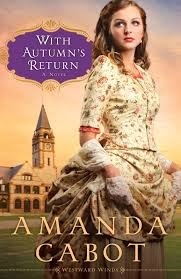 For the most part I’m a pretty big Amanda Cabot fan. Unfortunately, this novel couldn’t keep me interested. Bummer. When it comes to series books, you like to see the last one go out with a bang, because–heck–its the last one and you expect it to be good, right? Well, for me, this one just didn’t have what it takes to keep lil’ Miss Amber gagging for more. The first two books in this series were nice–but this one reminds me more of book one (Summer of Promise) which was fairly mild romance-wise. I thought book two (Waiting for Spring) was more exciting in the “lovey dovey” department as well as the excitement/drama department. But you’ll just have to read it yourself to make your own decision. Annnnnnnnnnd, that’s when I start skimming. Let’s talk about skimming for a second. I think we all do it to some degree or another, and with some books it’s more tempting to do than others. How often do you skim and are you a page by page skimmer or do you just do paragraphs? Frankly, if I am really bored I’ll skip entire pages, scanning for words that seem interesting and if I don’t find anything, I usually just skim to the end. If you’ve read it–let me know what you think!! I really enjoyed this one, and in fact the whole series. Amanda always provides lots of detail, which I appreciate. No, I don’t skim for the most part. Maybe a paragraph or two, but never entire pages.